Classic, designer-style for your garden. A metallic-finish pot to give a classic, elegant and contemporary finish. The perfect partner for standard roses, shrubs, annual bedding and select perennials, place by doorways, gateways and pathways or around patios for a real show-stopping feature. Made from durable and hardwearing plastic, it's frost and UV resistant with raised drainage holes and water reservoirs to allow your plants to thrive. A hand-painted design creates an eye-catching and stunning effect that will really add visual value to your beautiful plants - at a fraction of the cost of solid metal. Supplied as a heavy-duty polypropylene planter, 20cm (8in) diameter. 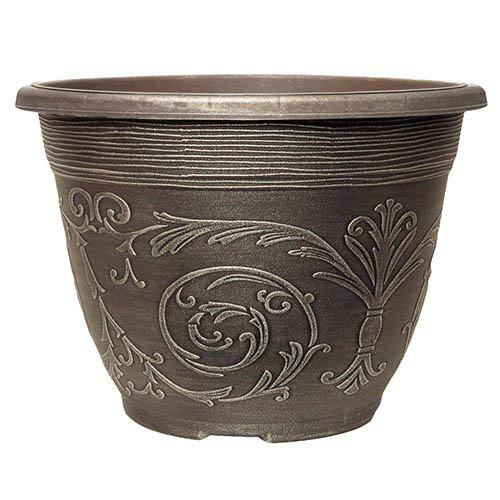 A metallic-finish 'Alhambra' pot to give a classic, elegant and contemporary design to your garden. Placed by doorways, gateways and pathways or around patios it's a real show-stopping feature, and the perfect partner to display your standard roses, shrubs, annual bedding and select perennials. Manufactured from hard-wearing frost and UV resistant plastic with raised drainage holes and water reservoirs to allow your plants to thrive, it is very durable and is perfect for using on your patio. Hand-painted using a new process, its metallic paint creates an eye-catching and stunning effect that will really add visual value to your beautiful plants. Supplied as a heavy duty polypropylene planter, 20cm (8in) diameter.